New York: Popular Library, 1970. Popular Library mass market paperback edition. First published in 1963. Bright, clean, uncreased copy with a few minor scrapes to front cover. 157 tight pages. Commander George Gideon of Scotland Yard faces a terrifying series of events.. Mass Market Paperback. Very Good. New York: Popular Library, 1970. 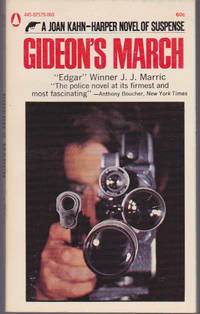 Popular Library mass market paperback edition. First published in 1962. Bright, clean, uncreased copy. 159 tight pages. The heat is on for Commander George Gideon of Scotland Yard when a summit conference in London puts diplomats in danger.. Mass Market Paperback. Very Good. New York: Harper & Row, Publishers, 1964. Book club edition, 1964. Fine copy in fine dust jacket. 243 pages, with red tint on top edges.. Book Club. Hard Cover. Fine/Fine. 8vo - over 7¾" - 9¾" tall. London: Corgi Books, 1970. Very good copy with uncreased spine, a bit of scuffing to back cover. A Patrick Dawlish thriller. Patrick and Felicity Dawlish were invited to the opening of Barney Day's antique shop in Dorset, but the visit -- to a lonely and isolated house -- proved to be more eventful than Dawlish had expected. Arriving in the middle of a snow storm he found the house deserted and the body of a dead policeman lying on the floor. 126 lightly age-toned pages.. First Thus. Mass Market Paperback. Near Fine. London: Pan Books Ltd., 1971. Fourth printing, 1971. Bright, clean copy with no creases or marks. 192 tight, lightly age-toned pages. Millionaire Paul Raeburn had a great capacity for evil. Every crooked scheme he touched turned to gold. Inspector Roger West wanted him badly, but Raeburn was too rich and too clever -- until he met a good-time girl and an ex-con with a taste for fish and chips.. Mass Market Paperback. Fine. London: Hodder & Stoughton, 1963. Very good copy with square, uncreased spine, a bit of rubbing to cover. 185 tight, lightly age-toned pages. A novel of suspense. When he knocked on the door of Arne Manor, little did Bob Curran know that upstairs the old man lay dead. When the police came in on the case, the relatives gathered round like vultures, eager to profit from the old man's will, eager also to frame the tall American in the murder inquiry.. Mass Market Paperback. COLLECTIBLE Very Good. London: Hodder Paperbacks, 1970. May began quietly for Scotland Yard Commander Gideon. Crime seemed to be taking a holiday. Then came the case of the ill-treated child, the case of the murdered receiver, and the case of the wife who jumped backward out of a window. . First Thus. Mass Market Paperback. COLLECTIBLE Very Good. London: Hodder & Stoughton, 1967. 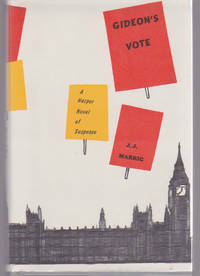 First Hodder paperback edition, 1967. Very good copy with faint spine crease, a bit of rubbing to back cover. 191 age-toned pages. The toff had met trouble many times but never before in the shape of a two-week-old baby. This was the bait that lured him into a duel with the Doc. No one had ever seen the Doc and yet his intricate network of blackmail and murder had terrorized London's Underworld and baffled Scotland Yard. The one man who could beat him at his own game was the Toff. . First Thus. Mass Market Paperback. Very Good. London: Corgi Books, 1971. Revised Edition, 1971. Very good copy with square, uncreased spine, a bit of rubbing to cover. 156 tight, age-toned pages. Featuring the Hon. Richard Rollison, known as The Toff.. First Thus. Mass Market Paperback. COLLECTIBLE Very Good. London: Mayflower-Dell, 1967. Very good copy with square, uncreased spine. 125 tight pages with moisture stain at top corner. A novel of suspense and terror. In a lonely country cottage, a pretty girl waits for the man whom this night will make her lover. In his place a stranger appears, a man at once frightening and oddly charming. This is the start of the time of terror. Marion is to find herself suspected of murder. Yet she is also to find a strange romance. As the tense minutes of this vivid drama tick away, suspense becomes almost unbearable, mounting to a climax of pure horror.. Mass Market Paperback. COLLECTIBLE Very Good. London: Hodder & Stoughton, 1969. Second printing, 1969. Bright, clean, uncreased copy. 192 tight, clean pages.. Mass Market Paperback. Very Good. New York: Pyramid Books, 1968. First Pyramid paperback printing, 1968. Very good copy with square, uncreased spine. 159 tight pages. The Toff was marked for a horrible death. Why?. First Thus. Mass Market Paperback. COLLECTIBLE Very Good. New York: Popular Library, 1970. 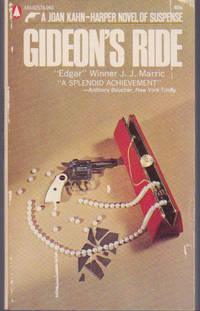 A Joan Kahn-Harper Novel of Suspense. Bright, clean, uncreased copy. 160 tight pages. Strong and sturdy Commander George Gideon of Scotland Yard finds himself in a mess with the press, money and murder. Only some shrewd planning can save the Yard and Gideon's career. . Mass Market Paperback. Collectible - Like New. London: Corgi Books, 1971. Revised Edition, 1971. Very good copy with square, uncreased spine, a bit of scuffing to front cover. 124 tight, lightly age-toned pages. A Patrick Dawlish thriller by John Creasey writing as Gordon Ashe. Roger Macclesfield, on holiday by the sea, saw a very pretty girl and decided to follow her. As he walked along the cliff, a bearded man asked him for a light, and then someone struck Roger on the head. When he came to, he saw a string of pearls lying in front of him. He put them in his pocket for safekeeping, and so began one of the most remarkable criminal episodes Dawlish ever investigated.. First Thus. Mass Market Paperback. COLLECTIBLE Very Good. London: Corgi Books, 1972. Revised Edition, 1972. Good copy with square, uncreased spine, a bit of scuiffing to cover. 191 tight, age-toned pages. Featuring the Hon. Richard Rollison, known as The Toff. It began with a Commando walking along Cheswick High Road in battle dress. A car brushed against him, and he went berserk. Firing his revolver, screaming oaths, he roared off in the vehicle, leaving wounded and dying scattered in the streets. Something about this curious case attracted The Toff's attention.. First Thus. Mass Market Paperback. COLLECTIBLE GOOD. New York: Pyramid Books, 1965. First printing, Pyramid R-1194, 1965. Bright, clean, uncreased copy with square spine. 160 lightly age-toned pages. The famous gentleman-adventurer throws a deadly surprise party.. First Thus. Mass Market Paperback. COLLECTIBLE LIKE NEW. London: Arrow Books, 1967. Arrow revised edition, 1967. A Department Z Adventure first published in 1936. Very good copy with a faint crease along spine on front cover. 191 lightly age-toned pages. A million people had been drugged into blind obedience to a fantastic criminal conspiracy. But for the men of Department Z, it all began with a murder at a cricket match on a peaceful summer afternoon.. Mass Market Paperback. COLLECTIBLE Very Good. London: Hodder Paperbacks Ltd., 1969. First Hodder Paperbacks printing, 1969. Very good copy with square, uncreased spine, a bit of rubbing to cover. 190 tight, lightly age-toned pages. A shot rings out in the great cathedral square, crowded to greet the oil magnate, Prince Asir of Jardia. Roger West, who has to make sure that the Prince arrives in London in one piece, has the devil of a job on his hands. An assassin lurks in the shadows and is going to be less sloppy next time.. First Thus. Mass Market Paperback. COLLECTIBLE Very Good.